After a visit to our local ‘early bird’ market, we came home with a super large bag of Red Delicious & Royal Gala apples. The apple purée I made with this apple mixture turned out a lovely pink hue. It started me thinking about single variety apple jam and how that would taste. I selected the reddest rosiest Red Delicious apples and got out the jam pot. Sugar has had quite a bashing in the food-media of late and while jam can be made without sugar (Apple Spiced Refrigerator Jam), that wasn’t my intention for this project. As a side note, I don’t see the point of substituting sugar with a manufactured/chemical sugar-like product but I will substitute sugar with a natural product such as honey (this Raspberry Honey Jam using apples instead of pectin sounds delicious). The sugar preserves the jam, so with less sugar, I found the jam needed to be stored in the refrigerator once opened and it didn’t keep as long as regular jam. That usually isn’t as issue in our house of four hungry teenagers. I found The High Heel Gourmet article Basic Jam for Beginners: All Natural, Low Sugar, No Pectin Added to be helpful in creating a low-sugar jam. So I guess my jam could be called Reduced-Sugar Red Delicious Jam…. anyhow, the jam turned out a beautiful colour. As for the taste – well there is probably a reason that apple is the supporting act of jam or is bolstered by strong flavours such as spice, vanilla or caramel. The jam was very very delicate in flavour. It is lovely on fresh scones or wholemeal toast, but once the accompaniment is fuller flavoured, the apple flavour disappears. 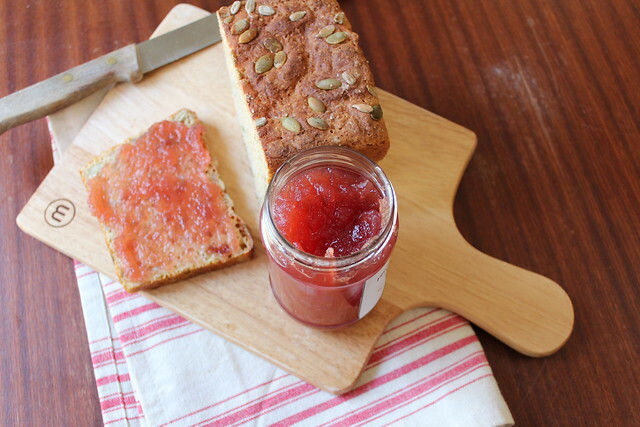 Having said that, this apple jam is a great base recipe to fiddle with. Adding extra flavours using spices, citrus zest, vanilla will enhance the flavour to a jam that is not only beautiful on the plate, but delicious to eat. 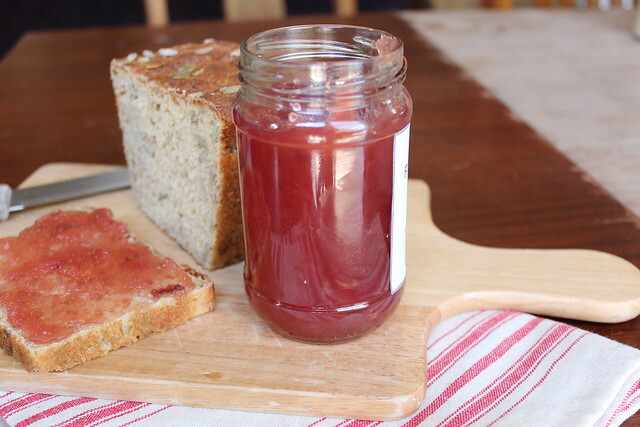 I have also made a Roasted Rhubarb & Rosewater Jam using Red Delicious apples as the base – that recipe is coming soon. Wash the apples then cut into 8ths (skins, pips, cores included). Place into a large pot, and soften over a low heat. Stir now and then to distribute the apples for even cooking. You can add a little water (1-2 T) to help this process along. Once the apples are a softened pulp, process through the food mill and discard the skins & pips. Return the apple pulp to the large pot and add the sugar and lemon juice. Bring to the boil, boil for 5-10 minutes (mine took 7 minutes to set). Test for setting then pour into sterilised jars and seal. Leave the jars undisturbed until the seals ‘pop’ then wipe outside of jars clean, label and store. Once opened, store in the refrigerator and use within a week. 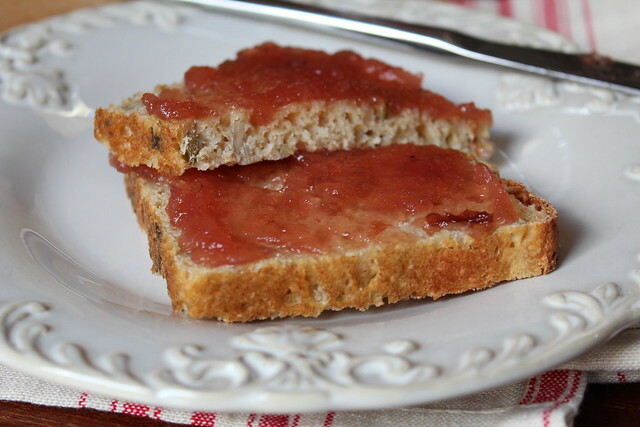 this jam can be made with white sugar, raw sugar or brown sugar. Raw sugar will give a slightly more caramel flavour, while brown sugar will give a darker colour and much more apparent caramel flavour. the bread is from NZ Masterchef Winner Nadia Lim’s first cookbook Nadia’s Kitchen. It is a very easy, very quick to prepare delicious seedy bread. If you love Vogel’s or Burgen breads, then this is a DIY version. Pop over to Nadia’s website for the recipe – it is very simple to make and well worth the minimal effort. if using non-organic apples, to completely wash away any spray residue, wash the apples in 3 parts water, 1 part vinegar (as per recommendation from Dr Libby). Rinse the washed apples in fresh running water. 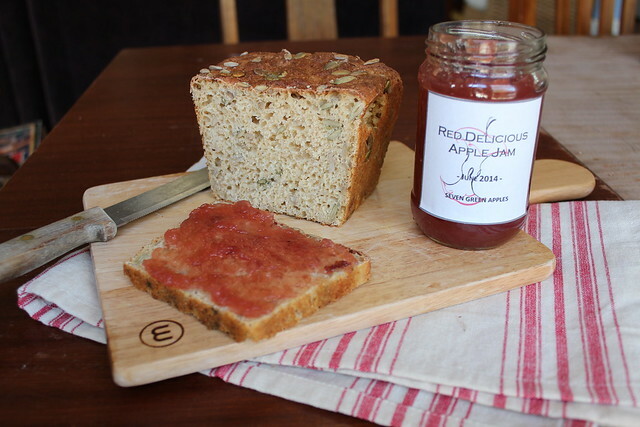 This entry was posted in Jam, Preserves and tagged Apple Jam, Nadia Lim, No Knead Seed Bread, Red Delicious, Reduced-Sugar Jam by Jo Dohrman. Bookmark the permalink.